1. We work directly with RCC instructors and make sure to provide you with exactly what you need for all of your classes. We offer new, used, rental and digital options for your textbooks and course materials. 2. Your money stays right here in our community. From student scholarships to supporting clubs, from great promotions to campus improvments your purchases help support. So whether you need course materials, supplies, apparel, snacks, information, or even a friendly smile, we have it all. 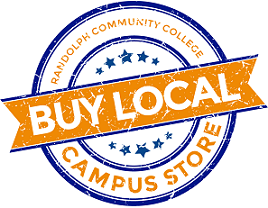 For assistance or information from the RCC Campus Store, call 336-633-0236.